And so, the new kid on the Australian TV brekkie block - 'Wake Up' on Channel Ten - starts tomorrow. First thing in the morning I need to be woken up BIG time, though it's easy-does-it for me, as I am not a morning person. Don't yell at me (at least not until the caffeine kicks in), don't be too crazy and OTT, and please keep me informed as I get my kids and I ready for school drop off. Will you be tuning in? I say do it! After all, Adam Boland is the man behind the the new show, and he was the person to give Channel 7's 'Sunrise' its first taste of success. 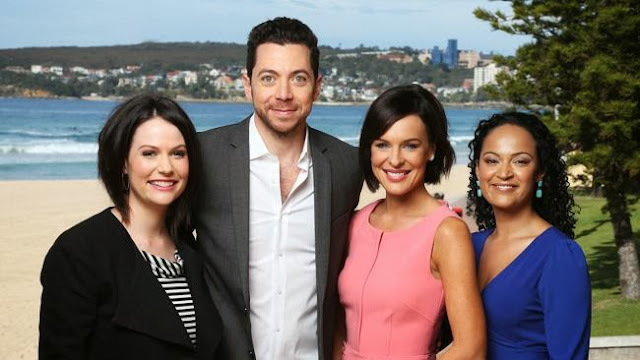 'Wake Up' will be hosted by James Mathison, Natarsha Belling, and Natasha Exelby, with Nuala Hafner as Melbourne reporter. The show will be broadcast live, five days a week, from a Manly surf club - which is a complete departure from rival breakfast shows, filmed in studios. 'Wake Up' will screen weekdays from 6.30am.